Egypt's President Abdul Fattah al-Sisi has given a bonus of $US85,000 to each of the players who clinched a place at the 2018 World Cup finals in Russia. A 2-1 win over Congo Brazzaville saw them qualify for the global showpiece for the first time since 1990. The president announced the reward on Monday as he met the Argentine coach Hector Cuper and the players. 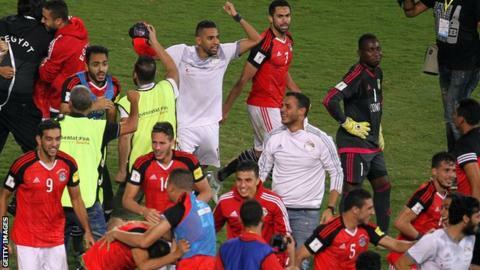 "Maybe we don't play beautiful football but we are at the World cup and that's the most important thing," Cuper said. Al-Sisi had special praise for match-winner Mohamed Salah, who scored a penalty in injury time to secure the qualification. "I am proud of all the players but especially of Mo Salah who was brave enough to take the crucial penalty," the president said. "Also thank you to coach Cuper who has made our dreams come true." Liverpool forward Salah was already looking ahead to Russia. "We are determined to make the country and continent proud in Russia," Salah said. "I am very happy to lead Egypt to a World Cup after 28 years and to make a 100 million proud of us." The Pharaohs have won a record seven Africa Cup of Nations titles but have only been to the World Cup twice in 1934 and 1990 and are yet to win a game at the finals.